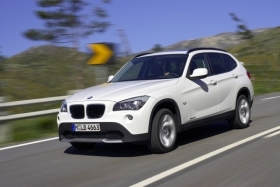 The X1 is boosting BMW's sales. PARIS (Bloomberg) -- BMW said deliveries in the third quarter beat its forecasts as the new X1 sport-utility vehicle and revamped 5-series sedan won customers. Sales of BMW, Mini and Rolls-Royce cars and SUVs rose about 16 percent in September to cap a “very good” three-month period, CEO Norbert Reithofer said. Group deliveries in September 2009 totaled 122,354 vehicles. Sales increased 9.1 percent in July 2010 and 13 percent in August. The CEO declined to comment on financial expectations for the third quarter, saying he hasn't seen internal figures yet. BMW has a target of selling 2 million cars and SUVs by 2020, and is planning on 10 percent growth in deliveries this year to 1.4 million vehicles. The automaker, which is also developing a new front-wheel-drive model, will overhaul the 1-series compact and 3-series sedan in the next two years, providing momentum for sales independent of economic developments, Reithofer said at the Paris auto show. The front-wheel-drive technology will be installed in BMW-brand models and will also be used in the Mini small-car lineup, Reithofer said. Sales volumes for the vehicles could total 700,000 to 1 million vehicles a year, he said. BMW doesn't need a partner for the front-wheel-drive platform because it can generate economies of scale on its own, Reithofer said.